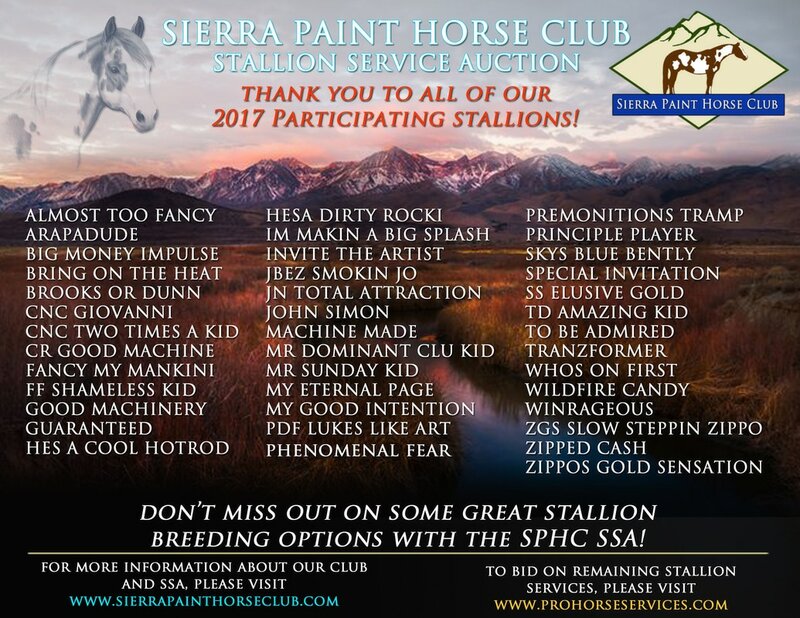 The Sierra Paint Horse Club Stallion Service Auction takes place every year at our POR in September. We have had great success with our futurities thanks to our wonderful stallion owners and the many breeders who purchase stallion services at our auction. Please come and participate in our SSA. We would love to post your SSA futurity winner's name here! Owners of selected stallions are invited to participate. Breeding services are sold to the highest bidder at the auction held online by Professional Horse Services, LLC (from December 31st, 2016 thru January 28th, 2017). Monies generated from the auction are added to futurities for the resulting foals. The stallion owner donates the breeding service and is also eligible to enter one foal by the participating stallion. For further information contact the Stallion Service Auction chairperson. The SSA will be conducted in partnership with Professional Horse Services LLC online for 2016/2017! We are very excited to work with them and for the increased advertising for the Stallions participating in our program! Our auction has ended, however, there are some great breedings available for a "Buy It Now" option - click the photo or HERE to go to the Auction Site to view available breedings! If you have already set up an Account – Go to #2 Below. with a Username and Password. • One account per email address may be established. • Keep your username and password in a safe place. record any bids you place. Approval to bid can be immediate, or take from 2 to 24 hours if you have provided all requested information. You will receive an email with your bidder’s number. It is your responsibility to make yourself familiar with these rules! !